Corrected QT interval (QTc) prolongation in humans is usually predictable based on results from preclinical findings. This study confirms the signal from preclinical cardiac repolarization models (human ether-a-go-go-related gene, guinea pig monophasic action potential, and dog telemetry) on the clinical effects on the QTc interval. A thorough QT/QTc study is generally required for bioavailable pharmaceutical compounds to determine whether or not a drug shows a QTc effect above a threshold of regulatory interest. However, as demonstrated in this AZD3839 [(S)-1-(2-(difluoromethyl)pyridin-4-yl)-4-fluoro-1-(3-(pyrimidin-5-yl)phenyl)-1H-isoindol-3-amine hemifumarate] single-ascending-dose (SAD) study, high-resolution digital electrocardiogram data, in combination with adequate efficacy biomarker and pharmacokinetic data and nonlinear mixed effects modeling, can provide the basis to safely explore the margins to allow for robust modeling of clinical effect versus the electrophysiological risk marker. We also conclude that a carefully conducted SAD study may provide reliable data for effective early strategic decision making ahead of the thorough QT/QTc study. Blockade of the human cardiac rapid delayed rectifier potassium current (IKr) [also known as the human ether-a-go-go–related gene (hERG) potassium channel] and QT interval prolongation have become surrogate markers for potential proarrhythmic effects of pharmaceutical compounds and have received increasing regulatory attention over recent decades (Vik et al., 2008). Drug-induced, ion channel–mediated prolongation of the heart rate (HR)–corrected QT interval (QTcR), in particular, may increase the likelihood of the polymorphous ventricular tachyarrhythmia known as torsades de pointes (TdP) (Cavero et al., 2000), which, in turn, may degenerate into ventricular fibrillation and sudden death (Roden, 2004). After the association between QTc prolongation and risk for TdP/sudden death was established in the mid-1990s, prolongation of the QT interval and/or the development of TdP became the most common reasons for withdrawing or restricting the use of drugs previously approved by the US Food and Drug Administration (Roden, 2004). Regulatory concerns have since been further consolidated because of the enlarging populations at risk, e.g., the elderly, who often are more fragile and exposed to polypharmacy with a related increased potential for drug-drug interactions; and patients with underlying cardiac, renal, or hepatic impairment that may increase both drug exposure and susceptibility to arrhythmia (Roden, 2004). An alternative evaluation for internal decision making, prior to an evaluation of the outcome of a thorough QT study, may be to collect thorough data on relevant biomarkers and ECG intervals already in the first-time-in-man study to allow for early assessment of efficacy and ECG safety margins. This approach requires early predictions of the anticipated therapeutic dose range and the use of one or more robust biomarkers of expected therapeutic effect. Preclinically, the hERG assay is used to determine the effect of the test compound on IKr conduction, and the guinea pig monophasic action potential (MAP) duration assay is used as an early predictor (Kågström et al., 2007) of QT liability in vivo. At a later stage, effects on QT are determined from ECG recordings in dogs. These results are used for early estimations of safety margin, although a more precise quantitative prediction of the level of QT prolongation to be expected in a clinical setting will be determined in human studies. A more precise estimate of the safety margin may be obtained by applying population pharmacokinetic/pharmacodynamic (PK/PD) modeling techniques, thus taking all data into account (Ollerstam et al., 2006; Lalonde et al., 2007). AZD3839 [(S)-1-(2-(difluoromethyl)pyridin-4-yl)-4-fluoro-1-(3-(pyrimidin-5-yl)phenyl)-1H-isoindol-3-amine hemifumarate] is a β-secretase inhibitor with a promising preclinical profile for treatment of Alzheimer’s disease (Jeppsson et al., 2012; Swahn et al., 2012). Data from the hERG assay, the guinea pig MAP assay, and QTc interval in dogs collectively predicted a potential risk for QT interval prolongation at exposures close to those expected for clinical efficacy. Therefore, a single-ascending-dose (SAD) study in healthy subjects was designed to allow for the exploration of PK of effects on the QTc interval using high-quality digital ECG as a safety marker, and for effects on amyloid-β peptides (Aβ) of 1–40 and 1–42 amino acids (Aβ1–40 and Aβ1–42, respectively) in plasma as efficacy biomarkers, using a cautious approach of small dose increments through a full range of predicted safe doses in humans. Effects on hERG-encoded potassium channel–expressing Chinese hamster ovary cells were recorded at room temperature in the whole-cell configuration of the patch-clamp technique. AZD3839 was investigated in five cells, into each of which was added vehicle solution (0.1% dimethylsulfoxide) and AZD3839 at six ascending nominal concentrations (0.3–100 μM). Following application of the highest test concentration, vehicle solution was reapplied to test the reversibility of the effect. The positive control (3 μM cisapride) was then applied. For each cell recorded, data obtained in the presence of the test compound were expressed as a percentage of the first application of vehicle solution. The IC50 value is based on test concentrations measured using a high-pressure liquid chromatography–tandem mass spectroscopy method. AZD3839 dissolved in 0.33% dimethylsulfoxide was tested at several concentrations in electrophysiologic assays at seven types of human recombinant voltage-gated cardiac ion channels: hNav1.5, hCav3.2, hKv1.5, hKv4.3/hKChIP2.2, hKv7.1/hKCNE1, hCav1.2/β2/α2δ, and hHCN4. Testing was conducted using an automated, 384-well plate–based electrophysiology device (IonWorks; Molecular Devices, Sunnyvale, CA) (Schroeder et al., 2003) and based on the method described by Bridgland-Taylor et al. (2006). In brief, for each experimental “run” of IonWorks, the device made perforated whole-cell recordings at ∼21°C from cells in a 384-well PatchPlate. Extracellular and pipette solutions of optimal composition and pH were used for each assay; the latter contained 100 μg/ml amphotericin B (Sigma-Aldrich, St. Louis, MO). For hCav1.2, the pipette solution was supplemented with 5 μM escin, 2 mM Na2ATP, and 0.3 mM Na2GTP (Sigma-Aldrich) and pH was adjusted to 7.2. After attainment of the whole-cell configuration, a precompound current was evoked in each cell in the presence of extracellular solution by a voltage pulse specific to each channel type. For hNav1.5 and hKv1.5 assays, the voltage pulse used enabled an assessment of whether any channel block was use-dependent. Test compound, vehicle, or positive control was then taken from a 96-well plate and added to each well, and after ∼3 minutes the voltage pulse was reapplied to generate a postcompound current. In between the pre- and postcompound voltage pulses there was no clamping of the membrane potential. All animal experiments were performed in accordance with the guidelines of the Swedish National Board for Laboratory Animals under protocols approved by the Ethical Committee of Southern Stockholm, Sweden. Studies were carried out in accordance with the Declaration of Helsinki and with the Guide for the Care and Use of Laboratory Animals as adopted and promulgated by the US National Institutes of Health. Male Dunkin-Hartley guinea pigs (Lidköpings Kaninfarm, Lidköping, Sweden) were allowed to acclimatize for at least 7 days prior to study in housing conditions according to AstraZeneca internal standard operational procedures. Animals were kept in groups of five per cage (1.75 m2) at room temperature (20 ± 2°C) and a relative humidity of 40–60%, with free access to food (K1; Lactamin, Stockholm, Sweden) and water (municipal tap water, ad libitum). Bedding material consisted of aspen woodcuttings (TAPVEI, Kortteinen, Finland). The surgical procedures have been described in detail previously (Kågström et al., 2007). Guinea pigs were anesthetized with pentobarbital and mechanically ventilated. A bilateral vagotomy was performed in the neck region to eliminate autonomic influence on the heart, and β blockade was achieved by administering 0.5 mg/kg i.v. propranolol 15 minutes prior to the start of the experiment. Following a subcutaneous dose of Xylocaine, the heart was exposed by a left-sided thoracotomy between the third and fourth sternal rib and a bipolar electrode was clipped to the left atrial appendage for cardiac pacing (1-millisecond duration, double the diastolic threshold) by means of a constant current stimulator (model A385; World Precision Instruments, Sarasota, FL). The pacing rate was set at ∼20 bpm above the spontaneous sinus rate. A custom-designed bipolar suction electrode was placed near the base of the left ventricular epicardium for recording of MAP signals. MAP duration at 90% repolarization (MAPD90), MAP rise time, and atrioventricular conduction time were recorded during cardiac pacing. Vehicle or drug (at 6.35 and 8.32 mg/kg) was infused intravenously over 32 minutes per dose followed by a washout period, and signals were continuously sampled. Blood samples were taken following each recording for determination of the plasma exposure profile. Data are presented as percent changes (mean ± S.E.M.) from the control recordings, and plasma levels as mean (± S.D.). Seven male beagle dogs (12–18 kg) (Rååhöjden, Örkelljunga, Sweden) were used. All dogs were trained to accept laboratory procedures prior to study. Dogs were studied at two separate occasions 8 months apart. Four animals were used at each occasion; one animal participated at both. Some dogs had participated in similar studies previously and were allowed a washout period of at least 3 weeks. At least 4 weeks prior to study, dogs were chronically instrumented with radiotelemetry probes to measure arterial blood pressure, body temperature, and ECG with subcutaneous electrodes (Data Sciences International, Inc., St. Paul, MN). Surgical procedures have been described in detail elsewhere (Ollerstam et al., 2007). Telemetry signals were sampled via receivers (RMC-1; Data Sciences International) and saved to a PC using Dataquest Open A.R.T. with IOX2 software (EMKA Technologies, Strasbourg, France). Data were collected continuously in 20-second segments for ∼1 hour before dosing and for up to 24 hours postdose. In study 2, additional recordings were resumed between 27 and 30 hours and between 32 and 48 hours postdose. Telemetry data were transformed on a PC with ecgAUTO software (EMKA) for analysis. All parameters are reported at nominal time points (±5 minutes for the 30-minute time interval; otherwise ±10 minutes) of 0, 0.5, 1, 2, 3, 4, 6, 10, 16, 18, and 23.5 (study 1) or 0, 1, 2, 4, 6, 10, 16, 18, 23.5, 29.5, 34, 36, 40, and 47.5 (study 2) hours after dosing. Time 0 is the mean of four predose values (−1, −0.75, −0.5, and −0.25 hour). All parameters were averaged over 1 minute, or when not allowed due to data quality, over 20 or 40 seconds. Selection of data was made based on stable HR (Yang et al., 2001). If the initial automated selection was not considered adequate, another part of the recording within the nominal range was selected manually. The ECG signal was checked for correct positioning of ecgAUTO markers, and waveform morphology was reviewed for each animal at each time point. where β is calculated as the slope of QT versus HR, both of which are derived from the data extracted (Ollerstam et al., 2006). Data are presented as percent changes (mean ± S.E.M.) from the time-matched vehicle values, and plasma levels as mean ± S.D. For the determination of the plasma concentration of AZD3839, blood samples were taken from the jugular vein prior to dosing and at 0.5, 1, 2, 4, 24, and 30 (study 1) or 1, 2, 4, 6, 24, 30, and 48 (study 2) hours postdose. One sample was taken prior to and one sample 2 hours after administration of the vehicle, and sham blood sampling was performed in the vehicle experiments to replicate the disturbance in the measured parameters from the AZD3839 experiments. Blood samples were mixed with K2 EDTA as an anticoagulant and immediately cooled on ice until centrifugation. Plasma was prepared by centrifugation at 4°C for 10 minutes at 1500g within 30 minutes of blood sampling. Approximately 0.4 ml plasma was transferred to 1.1-ml tubes (FluidX Ltd., Nether Alderley, UK) and immediately frozen at or below −70°C. The frozen plasma sample tubes were placed in Roborack (FluidX Ltd.). The plasma concentration of AZD3839 was determined by ultrafiltration and liquid chromatography followed by mass spectrometric detection. The lower limit of quantification was set to 0.05 μM. The validated calibration range was 0.05–50.0 μM. The study was performed in accordance with ethical principles based on the Declaration of Helsinki and consistent with the International Conference on Harmonization (1996) Good Clinical Practice guidelines (http://www.ich.org/fileadmin/Public_Web_Site/ICH_Products/Guidelines/Efficacy/E6_R1/Step4/E6_R1__Guideline.pdf), applicable regulatory requirements, and the AstraZeneca policy on Bioethics and Human Biologic Samples. More detailed information regarding the study design PK of AZD3839, effects on the plasma efficacy biomarkers Aβ1–40 and Aβ1–42, and PK/PD relationship are presented elsewhere (Quartino et al., 2014). The study was a randomized, placebo-controlled, SAD study (double-blind within dose groups) in healthy subjects 18–55 years of age. In each of the nine dose groups, six of the subjects received a single oral dose of AZD3839 and two were administered placebo. In each dose group, a sentinel subject was exposed to AZD3839 and one subject was administered placebo on the first day. Provided there were no serious or unexplained safety issues for at least 24 hours postdose as judged by the investigator, the remaining six subjects in the dose group were also administered AZD3839 or placebo. Administration of AZD3839 occurred on day 1 with safety monitoring, including frequent collection of digital and paper ECG and 72 hours of telemetry. ECG recordings (RR, PQ, QRS, and QT intervals from the primary lead of the digital 12-lead ECG) were performed at the same time points as AZD3839 plasma concentration sampling (at predose and at 20 minutes, 40 minutes, and 1, 1.5, 2, 3, 4, 6, 8, 12, 24, 36, 48, and 72 hours postdose) using a 12-lead continuous digital ECG (dECG) recorder (Schiller Cardiovit CS-200 recorder; Schiller AG, Baar, Switzerland). The QT interval was measured using the tangent method applied on 10 10-second extractions derived per 5-minute recording at each time point. The predose recording lasted 10 minutes, and each postdose recording lasted 5 minutes. The primary lead chosen for analysis was precordial ventral V2 (with precordial lead ventral V5 as backup in case lead V2 was deemed unsuitable for analysis). The analysis was performed with the internally developed AstraZeneca semiautomatic software application EClysis, version 3.2 (AstraZeneca, Mölndal, Sweden). In addition to the dECG measurements, 12-lead paper printout ECGs were also recorded at screening, at enrollment, at all prescheduled dECG time points for immediate safety assessment during the study day, and at follow-up. Effect on the QTcR interval in humans was analyzed using Fridericia’s formula: QTcF = QT/RR1/3 (Fridericia, 1920; Roden, 2004; Vik et al., 2008), where QTcF is the QT interval corrected by the Fridericia method. Serial blood samples for AZD3839 concentrations and efficacy biomarker (plasma Aβ1-40 and plasma Aβ1-42) evaluation were drawn up to 72 hours postdose. To be eligible for the study, subjects had to have a QTcF interval of 340–450 milliseconds and have no family history of long QT syndrome. Between each dose group a safety review committee analyzed blinded PK and safety data, including bedside safety ECGs. Digital ECG interval data were also reviewed by a trained cardiologist and were included in the evaluation before each dose-escalation decision. The PK and QTc data were analyzed using nonlinear mixed-effects modeling and the first-order conditional estimation with η-ε interaction using the NONMEM 7.2 software (Icon Development Solutions, Elliot City, MD). The PK of AZD3839 in dog displayed a two-compartment disposition with a first-order absorption and linear elimination. The free fraction in dog was concentration-dependent, being 6.4% at 0.4 μM, 9% at 10 μM, and 15% at 150 μM. Because the highest concentration observed in the dog study was 12.5 μM, an average of 6.5 and 9% equal to 7.75% was used to convert total to free concentration. In the healthy volunteers study, the PK of total plasma concentrations of AZD3839 has been described using a two-compartment PK model with nonlinear distribution to a third peripheral compartment, a combined zero- and first-order absorption process, and a linear elimination. The relative bioavailability for AZD3839 was found to be nonlinear and resulted in higher than dose-proportional increase in drug exposure with dose. A free fraction of 3.6% was used to convert total to free concentrations in humans (Quartino et al., 2014). Between-subject variability (BSV) was described by a lognormal variance model, and a proportional residual error was modeled as additive on log-transformed data. (2)where AMP is the amplitude of the cosinus function, PHS is the phase shift relative to the time of dose (t), and I is the time period. A clear difference in placebo response was seen 10 hours postdose in the two dog studies. To take this into account, a “study effect” was tested as a categorical covariate on all parameters in the placebo model and was found to be significant on PHS for 24 hours. (3)where the Cp represents the plasma concentration, Ce the concentration in the effect compartment, and ke0 the estimated time delay. The concentration range was large enough in dogs to quantify both the maximal drug effect (Emax) and the potency (EC50) (eq. 4), while a power model with the estimated parameters slope and the shape parameter (γ) (eq. 5) was sufficient to describe the concentration-effect relationship in healthy volunteers. (5)BSV was described by a lognormal variance model. The covariance matrix for random effects was used to evaluate the correlations between model parameters. In dogs, QTcR BSV was found to be significant on baseline, 24-hour PHS, and Emax. In humans, QTcF BSV was quantified for baseline and residual error magnitude (ETA on Epsilon). The residual variability was described with a proportional residual error model for both species. Model development and evaluation was based on objective function value (−2 log-likelihood), precision in parameter estimates, and graphical diagnostics. A significance level of P < 0.01, corresponding to a decrease of 6.63 in objective function value for one degree of freedom, was used through the model development. Graphical visualization of the model fit was performed using the software R with the Xpose 4 library (http://xpose.sourceforge.net/), and for automated estimation and simulation procedures the software Perl-speaks-NONMEM (http://psn.sourceforge.net/) was used. The predictive performance of the model was assessed by a prediction-corrected visual predictive check (Bergstrand et al., 2011), where the observations and predictions (n = 2000) were normalized across doses. The robustness of the model and the parameter precision (relative standard error %) were assessed by the bootstrap resampling method for the clinical data (Lindbom et al., 2005). For each bootstrap, 500 replicated data sets were generated from the original data set with replacement and stratified by dose and study. For the study in dogs, the relative standard error was calculated based on the SR-matrix obtained in the NONMEM output for the PK model and based on the R-matrix obtained in the NONMEM output for the QTc model. AZD3839 (mol. wt., 431.4) (AstraZeneca R&D, Södertälje, Sweden) and vehicle formulations for oral administration were prepared on the day before the start of the experiments and were stored refrigerated (+2 to +8°C) in sealed glass bottles, protected from light. AZD3839 was dissolved in 0.3 M gluconic acid, adjusted to pH 3. Solutions of 0.75, 2.5, and 7.5 mg/ml were prepared and were administered orally by gavage at 2 ml/kg body weight at 1.5, 5, and 15 mg/kg (study 1) and 15 mg/kg (study 2). Guinea pigs and dogs received vehicle orally 3 days prior to the AZD3839 experiments in both studies. The positive control cisapride abolished hERG tail current (data not shown). Normalized hERG tail current plotted against the measured perfusate concentration of AZD3839, and fitted using the nonlinear curve-fit function of Origin, yielded an IC50 value (two-sided 95% CI) of 4.8 μM (3.8–6.2 μM). At other cardiac ion channels, AZD3839 caused IC50 values of 23.6 μM at hNav1.5 and 62.3 μM at hCav3.2. Maximum percentage inhibition at 100 μM was 43.1 at hKv4.3/hKChIP2.2 and 31.4 at hKv1.5. AZD3839 was inactive (<25 μM) at hCav 1.2/β2/α2δ, hKv7.1/hKCNE1, and hHCN4. In the guinea pig MAP assay (n = 4), AZD3839 caused a maximum mean prolongation (± S.E.M.) of MAPD90 of 10.7% ± 1.2% at 37 minutes after start of infusion, resulting in a maximum mean difference from vehicle of 8.6% ± 6.1% (95% CI). AZD3839 had no significant effect on other MAPD parameters compared with vehicle treatment. A maximum mean (± S.D.) AZD3839 Cmax of 10.1 ± 3.5 μM (2.02 ± 0.4 μM; free) was obtained 57 minutes after start of infusion. 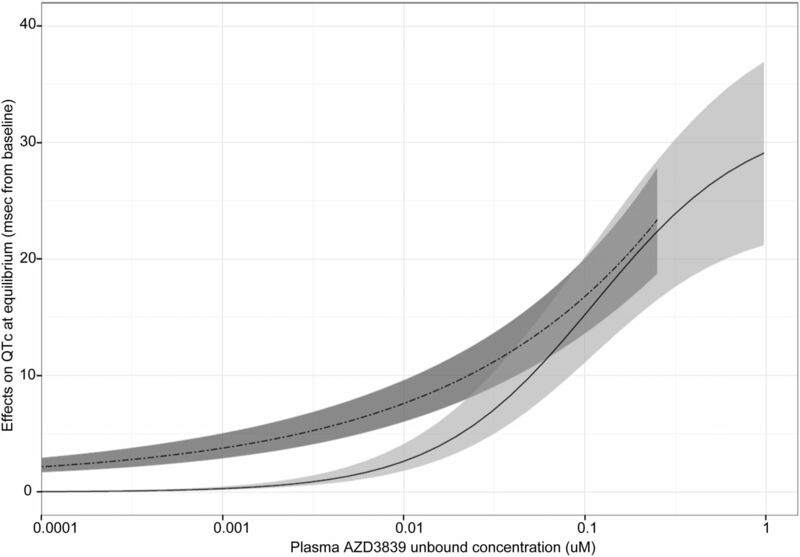 AZD3839 in the dog telemetry study induced a dose-dependent increase in plasma concentration (Fig. 1A) and dose-related increase in QTcR (Fig. 1B). A maximum mean QTcR prolongation of 29 milliseconds (12%) was observed at 4 hours following a dose of 15 mg/kg. The Cmax (± S.D.) of AZD3839 at this dose was 9.22 ± 0.88 μM (0.71 ± 0.07 μM; free). The no-effect dose in this study was 5 mg/kg (total Cmax, 4 μM; free Cmax, 0.31 μM). The average fraction unbound used for conversion of total to free drug concentration in dog was 7.75%. No arrhythmia was observed, and there were no significant changes in HR or in PQ or QRS intervals. Observed geometric mean plasma concentrations of AZD3839 versus time after a single oral dose of AZD3839 in dog (A) and in human (C). Observed mean QTc change from baseline versus time in dog (B) and in human (D) (*dog study 2). The SAD study comprised nine dose groups in the dose range of 1–300 mg. Digital ECG, bedside safety paper ECG, and telemetry were performed, and a safety analysis blinded to treatment was done before each dose escalation. A dose-dependent increase in plasma concentrations (Fig. 1C) and a corresponding QTcF prolongation (Fig. 1D) were demonstrated following single oral doses of AZD3839. The mean (range) individual maximum QTcF prolongation was 21 (17–26) milliseconds in the highest-dose group (300 mg). The QRS, RR, and PQ intervals showed no significant changes, and no arrhythmia was observed. All doses were well tolerated, and dose escalation was stopped due to reaching the predefined exposure limit for Cmax. The PK of AZD3839 in healthy humans was highly variable between subjects, in particular the Cmax [mean, 0.70 nM (range, 0.34–1.42 nM) for 1 mg; and 3400 nM (2500–7200 nM) for 300 mg]. ECGs were closely monitored, and no subject had a QTc interval >450 milliseconds or a change from baseline >30 milliseconds at any measurement, suggesting that the precautions taken (e.g., eligibility criteria, restrictions, and rate of dose escalation) and the level of monitoring were appropriate and that the individual risk for proarrhythmia was minimized in this study, i.e., no subject showing a change from baseline >60 milliseconds or an absolute QTcF >500 milliseconds. Concentration-Response Relationship in Dog and Humans. To quantify the concentration-response relationship in dog and healthy subjects, a population modeling approach was used. The population PK model describing the total plasma concentrations of AZD3839 in humans is presented elsewhere (Quartino et al., 2014). In the dog, the total concentrations of AZD3839 were well characterized by a two-compartment model with first-order absorption and linear elimination. The effects on QTc seen in dog and human were each quantified using a PK/PD model where the observed QTc response was modeled as the sum of the vehicle/placebo response and the drug effect. A time delay between peak drug concentration and maximal effect on QTc was seen for both species (Fig. 1) and was handled by including an effect delay compartment model. The estimated population parameters and their precision for the final PK and PK/PD models are presented in Tables 1 and 2. The ε-shrinkage was low (3.6, 2.6, and 5.5% for the PK model in dog, QTc model in dog, and QTc model in healthy subjects, respectively), indicating that the model can accurately predict individual time-course data for the dogs and healthy subjects in these studies, confirming the appropriateness of the sequential PK and PK/PD modeling approach and use of goodness-of-fit plots for model evaluation. 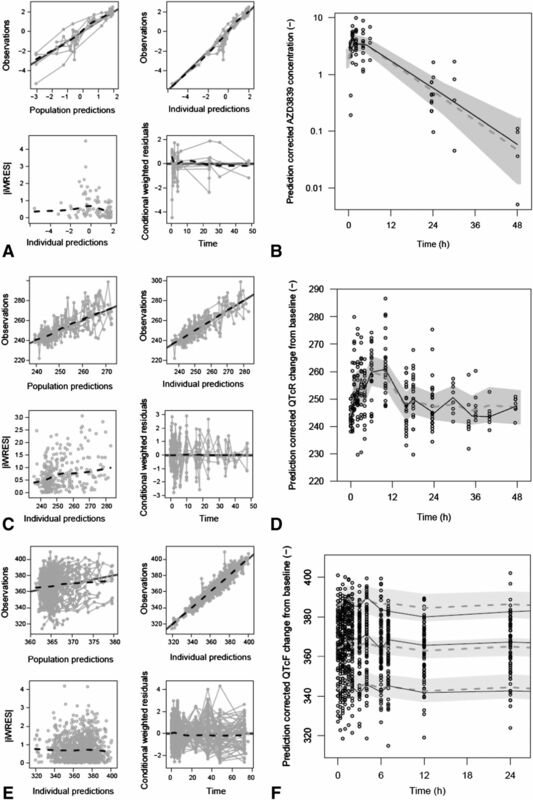 The models were evaluated using graphical presentation and internal validation methods, and goodness-of-fit plots showed no trends, confirming that the models can satisfactorily describe and predict real data (Fig. 2, A, C, and E). Further, the prediction-corrected visual predictive checks showed that the simulated and observed 95% CI of the median overlapped (Fig. 2, B, D, and F). Graphical evaluation of the model fit. The goodness-of-fit plots for PK in dog (A), QTcR in dog (C), and QTcF in human (E) show no trends for observed data versus population model predictions (upper left); for observed data versus individual model predictions (upper right); for individual weighted residuals (iWRES) versus individual model predictions (lower left); or for conditional weighted residuals versus time after dose (lower right). The prediction-corrected visual predictive check (pcVPC) for PK (B) and QTcR (D) in dog and QTcF in human (F) are normalized for dose and study differences. Observed data (dots) and the median of the observed data (solid lines) are shown together with the model-simulated median (dashed lines) and the 95% CIs around the model-simulated median (shaded area) (for QTcF in human, also the 10th and 90th percentiles of the observed and simulated data). Solid lines (black) are the corresponding percentiles of the observed data. The pcVPCs demonstrate that the model can capture the central tendency and variability of the observed data. The maximal QTc prolongation in dog was estimated at 33 milliseconds (14% at a baseline QTcR of 255 milliseconds), while it could not be quantified in humans in the dose range used in the SAD study. The model-predicted time course of the QTc changes caused by vehicle/placebo, the true drug effect, and the vehicle/placebo-plus-drug effects (i.e., what is observed in the treated dogs/healthy subjects) following 15 mg/kg in dogs and a 300-mg dose in healthy humans are shown in Fig. 3. The concentration-effect relationship was very similar for dogs and healthy humans when the uncertainty in estimated population parameters was taken into account (Fig. 4). In healthy subjects, the model estimated a QTcF prolongation of 5 milliseconds at 131 nM (free, 4.7 nM) and 10 milliseconds at 806 nM (free, 29 nM) AZD3839 in plasma. Given the estimated population baseline value for QTcF in humans (363 milliseconds), 5 and 10 milliseconds correspond to 1.4 and 2.8%, respectively. The model-predicted plasma concentration of AZD3839 (dotted line) and QTc change due to vehicle/placebo effect (dashed/dotted line), drug effect (dashed line), and vehicle/placebo effect plus drug effect (solid line) for dogs in study 1 following a single oral dose of 15 mg/kg (left) and in humans in the SAD study following a single oral dose of 300 mg (right). Model-predicted concentration-effect relationship for change in QTcR in dog (dashed black line) and change in QTcF in humans (solid gray line) with the corresponding 95% parametric CI (shaded areas) accounting for the uncertainty in model parameter estimates (calculated using the covariance matrix in dog and the bootstrap in humans). A clear overlap can be seen in QTc response between dog and human, indicative of the dog being a predictive model for QTc in humans. A graphic translational comparison between hERG, guinea pig MAP, and dog and human QT prolongation was constructed, comparing the percentage change in QT-related measures against the free concentrations of AZD3839 (Fig. 5). A clear leftward shift of the concentration-effect curves from in vitro (hERG) via guinea pig and to dog and to human can be seen. Although the expected margin in humans between the predicted minimal therapeutic effect level of at least 20% reduction of Aβ1–42 in plasma and QT prolongation based on preclinical data was predicted to be narrow, the SAD study was conducted to determine the magnitude of the expected QT prolongation, to better understand the PK/PD relationship in humans, and to confirm or refute a possible therapeutic window. The diagram shows that the preclinical models were concordant and did well predict the QT findings in the SAD study. Concentration-effect relationship across studies. Percentage inhibition of the hERG channel and percent change on the action potential duration at 90% repolarization (APD90) in guinea pig (GP) plotted as mean ± S.E.M. based on observed data. Percent changes from baseline in QTcR in dog and in QTcF in humans are based on the developed PK/PD models at a QTc baseline of 244 milliseconds in dog and 363 milliseconds in humans. The estimated minimum therapeutic concentration (40 nM; free, 1.45 nM) is defined as the concentration giving an average 20% reduction of plasma Aβ1–42 following an extended-release formulation at steady state (vertical dotted line). The main objective of the SAD study was to evaluate safety and tolerability in general and the PK/PD relationship between dose, plasma concentration, and effects of AZD3839 on plasma biomarkers (Aβ1–40 and Aβ1–42) and on QTcF. In this paper, we focus on describing the translation of nonclinical to clinical QT-related effects and on presenting the QTcF data from the SAD study. The preclinical findings of hERG blockade, guinea pig MAPD90, and QTc interval prolongation in dog were considered when selecting the starting dose, rate of dose escalation, and exposure limit for the SAD study. In spite of a high degree of BSV in PK in humans (Quartino et al., 2014), a clear dose-dependent increase in QTc interval prolongation was demonstrated in the SAD study. The concentration-effect predictions of human QTc prolongation, based on the preclinical findings, were well confirmed in the human study, showing an overlap of the 95% CIs across the entire concentration-effect curve for the dog and human data. Further, the hERG and guinea pig MAP data served as good predictors of QT prolongation in the dog as well as in humans. Given the strength of the mechanistic link between hERG block and QTc prolongation, it would be tempting to expect a quantitative relationship between hERG potency and free plasma levels at which QTc increases are seen in man. While there is evidence of a quantitative link between the two (Wallis, 2010; Gintant, 2011), it would be surprising if this were the case for all compounds. It is, after all, a comparison between hERG potency measured in a cell line in a way that cannot completely replicate the channel’s behavior in vivo and a QTc effect in dog/man that is plotted relative to free plasma levels (as opposed to intracellular ventricular myocyte concentration, which is the effect compartment). Although there is no detailed quantitative comparison of guinea pig to man/dog QT data, it is unlikely that an increase in MAP duration in an anesthetized, vagotomized, β-blocked guinea pig would necessarily overlay QTc data in conscious dogs/humans; dogs and guinea pigs have a species homolog of hERG, but the overall molecular physiology of repolarization is not the same across the species (Nerbonne and Kass, 2005). Hence, despite the difference in the hERG/guinea pig data relative to those of dog/man, it is unlikely, in our opinion, that the effect is mediated via a non–hERG-block mechanism. It has previously been reported that drugs without reports of TdP in humans have a >30-fold separation between hERG IC50 and free plasma concentrations at therapeutic levels (Redfern et al., 2003). However, drugs with high hERG affinity do not necessarily produce QTc prolongation in the clinic. A well known exception to this correlation is verapamil, a potent blocker of the hERG channel but without association with QTc prolongation or TdP arrhythmia (Zhang et al., 1999; Yang et al., 2001). Another example is the muscarinic antagonist tolterodine, with a hERG IC50 of 11 nM and a prolonged action potential duration in guinea pig cardiomyocytes, but with no QTc prolongation in man (Kang et al., 2004). These apparent discrepancies are probably due to a concurrent blockade of cardiac calcium channels by these compounds that may attenuate the QT-prolonging effects. In contrast, AZD3839 did not display significant effects on other cardiac ion channels at therapeutically relevant concentrations. Recently, the β-amyloid–cleaving enzyme inhibitor MK-8931 was reported to induce 6- to 15-millisecond increases in the QTc interval following single doses of 300 mg or higher to healthy volunteers (Tseng et al., 2012). On the other hand, although no numerical values were provided, the discontinued Eli Lilly (Indianapolis, IN) β-amyloid–cleaving enzyme inhibitor LY2811376 [(S)-4-(2,4-difluoro-5-(pyrimidin-5-yl)phenyl)-4-methyl-5,6-dihydro-4H-1,3-thiazin-2-ylamine] was reported not to induce any clinically significant alterations in the ECG in a single-dose study in man (May et al., 2011). The QTc assessments performed in the AZD3839 SAD study through the use of high-resolution dECG data allowed for detecting modest QTc prolongations of the magnitude of regulatory concern that are usually not investigated prior to the thorough QT study. Using the PK/PD model, the safety margin between an anticipated therapeutic effect level (minimally an average of 20% reduction of Aβ1–42 in plasma) and QTcF prolongation of regulatory concern (∼5 milliseconds) was also predicted if given twice daily and every hour. A 20% average reduction in plasma Aβ1–42 was achieved by doses of 110 mg twice daily or 8 mg every hour, yielding steady-state Cmax of 400 and 45 nM, respectively (Quartino et al., 2014). At these concentrations, 7- and 3.3-millisecond QTcF prolongations are expected based on the presented PK/PD model herein. Thus the model predictions showed that even if the drug was to be administered every hour, mimicking an extended-release formulation, an acceptable safety margin would not be obtained. The between- and within-subjects variabilities in PK and PD data further contribute to the narrowing of the safety margin. Moreover, preclinical data suggested both potential induction and inhibition of CYP3A4, which was also shown to be the main route of elimination (data not shown). Therefore, kinetics in repeated dosing are difficult to predict, and potential concomitant administration of a strong CYP3A4 inhibitor, such as ketoconazole, would decrease margins even further. Thus, by using population modeling in combination with careful collection and analysis of multiple replicate dECG data, this study established an exposure-response relationship for QTcF within a modest range of QT prolongation, demonstrating the benefits of high-quality dECG data generated in the SAD study. The current data confirm the predictability of the nonclinical models to humans and show that preclinical data together with a carefully designed and monitored SAD study may provide reliable information for an early and science-based development decision. The authors thank Karl-Gustav Jostell for valuable comments on study design, Pär Karlsson for discussions on statistics, Kristina Claeson-Bohnstedt for bioanalysis, Tim Ashwood for discussions on biology, Tina Olsson for project management, and Gunilla Huledal for discussions on pharmacokinetics. The technical expertise of Niklas Poijes and Eva-Lena Laumola in the guinea pig MAP studies and Michael J. Morton and Claire E. Sefton in the in vitro studies is greatly acknowledged. Participated in research design: Bridgland-Taylor, Bulgak, Kågström, Sjödin, Al-Saffar, Teiling-Gårdlund, Swedberg, Sparve, Paulsson. Conducted experiments: Bridgland-Taylor, Kågström, Sjödin, Bulgak. Performed data analysis: Bridgland-Taylor, Kågström, Sjödin, Bulgak, Quartino, Tunblad, Sparve, Paulsson, Alexander. Wrote or contributed to the writing of the manuscript: Sparve, Quartino, Swedberg, Lüttgen, Tunblad, Vik, Paulsson, Fälting, Pollard. Authors were employees of AstraZeneca at the time of the studies. AstraZeneca R&D, Södertälje, Sweden (E.S., A.L.Q., M.L., K.T., A.T.G., J.F., R.A., J.K., L.S., A.B., A.A.-S., M.D.B.S., B.P. ); AstraZeneca R&D, Alderley Park, United Kingdom (M.B.-T., C.P. ); AstraZeneca R&D, Mölndal, Sweden (T.V.). (2011) Prediction-corrected visual predictive checks for diagnosing nonlinear mixed-effects models. AAPS J 13:143–151. (2006) Optimisation and validation of a medium-throughput electrophysiology-based hERG assay using IonWorks HT. J Pharmacol Toxicol Methods 54:189–199. (2000) Drugs that prolong QT interval as an unwanted effect: assessing their likelihood of inducing hazardous cardiac dysrhythmias. Expert Opin Pharmacother 1:947–973. (2005) Guidance for Industry, E14 Clinical Evaluation of QT/QTc Interval Prolongation and Proarrhythmic Potential for Non-Antiarrhythmic Drugs, US Department of Health and Human Services, FDA, Center for Drug Evaluation and Research, Silver Spring, MD. (1920) The duration of systole in the electrocardiogram of normal subjects and of patients with heart disease. Acta Med Scand 53:469–486. (2011) An evaluation of hERG current assay performance: translating preclinical safety studies to clinical QT prolongation. Pharmacol Ther 129:109–119. (2012) Discovery of AZD3839, a potent and selective BACE1 inhibitor clinical candidate for the treatment of Alzheimer disease. J Biol Chem 287:41245–41257. (2007) Evaluation of the guinea pig monophasic action potential (MAP) assay in predicting drug-induced delay of ventricular repolarisation using 12 clinically documented drugs. J Pharmacol Toxicol Methods 56:186–193. (2004) Cardiac ion channel effects of tolterodine. J Pharmacol Exp Ther 308:935–940. (2007) Model-based drug development. Clin Pharmacol Ther 82:21–32. (2005) PsN-Toolkit—a collection of computer intensive statistical methods for non-linear mixed effect modeling using NONMEM. Comput Methods Programs Biomed 79:241–257. (2011) Robust central reduction of amyloid-β in humans with an orally available, non-peptidic β-secretase inhibitor. J Neurosci 31:16507–16516. (2005) Molecular physiology of cardiac repolarization. Physiol Rev 85:1205–1253. (2007) A novel approach to data processing of the QT interval response in the conscious telemetered beagle dog. J Pharmacol Toxicol Methods 55:35–48. (2006) Pharmacokinetic-pharmacodynamic modeling of drug-induced effect on the QT interval in conscious telemetered dogs. J Pharmacol Toxicol Methods 53:174–183. Quartino A, Huledal G, Sparve E, Lüttgen M, Bueters T, Karlsson P, Olsson T, Paraskos J, Maltby J, Claeson-Bohnstedt K, et al. (2014) Population pharmacokinetic and pharmacodynamic analysis of plasma Aβ40 and Aβ42 following single oral doses of the BACE1 inhibitor AZD3839 to healthy volunteers. Clin Pharmacol Drug Dev DOI: 10.1002/cpdd.130 [published ahead of print]. (2003) Relationships between preclinical cardiac electrophysiology, clinical QT interval prolongation and torsade de pointes for a broad range of drugs: evidence for a provisional safety margin in drug development. Cardiovasc Res 58:32–45. (2003) Ionworks HT: a new high-throughput electrophysiology measurement platform. J Biomol Screen 8:50–64. (2012) Design and synthesis of β-site amyloid precursor protein cleaving enzyme (BACE1) inhibitors with in vivo brain reduction of β-amyloid peptides. J Med Chem 55:9346–9361. , et al. 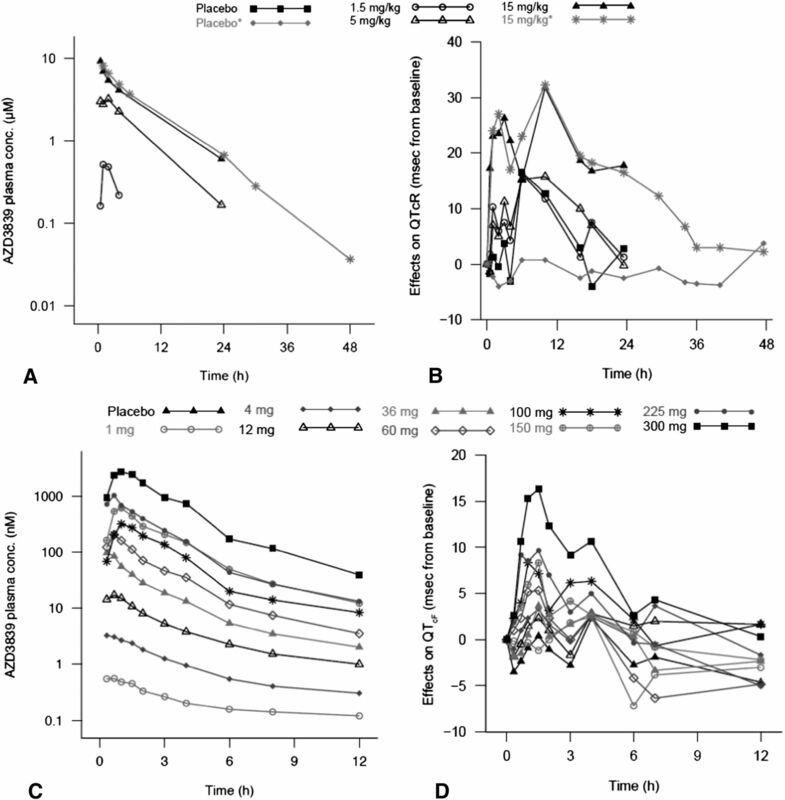 (2012) Safety and pharmacokinetics of the novel BACE inhibitor MK-8931 in healthy subjects following single and multiple dose administration. Alzheimers Dement 8:S184–S185. (2008) Early clinical development: evaluation of drug-induced torsades de pointes risk. Pharmacol Ther 119:210–214. (2010) Integrated risk assessment and predictive value to humans of non-clinical repolarization assays. Br J Pharmacol 159:115–121. (2001) Drug block of I(kr): model systems and relevance to human arrhythmias. J Cardiovasc Pharmacol 38:737–744. (2003) Simultaneous vs. sequential analysis for population PK/PD data I: best-case performance. J Pharmacokinet Pharmacodyn 30:387–404.